Tenby Apartment is a 1-bedroom upstairs apartment. This fantastic apartment features a fully equipped modern kitchen, a stylish lounge and cosy bedroom with en-suite tiled bathroom. Tenby Apartment has been finished to a very high standard with wonderful art and tasteful decor. The full windows in the lounge capture the gorgeous mountain vistas of Wanaka. There is a telescope from which you can properly enjoy views of the Mt Aspiring National park and Lake Wanaka. Tenby 1 also features a huge private balcony with BBQ to help you relax at the end of the long summer days soaking up the incredible views. The Tenby Apartment features undercover garaging, full laundry facilities and dedicated ski drying rooms for your convenience. 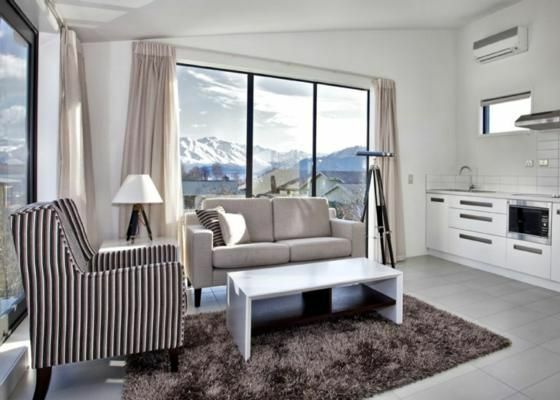 Tenby Apartment is ocated only 5 minutes walk from the Central Wanaka Village and lakefront. Wanaka is renowned for its fabulous selection of cafes, restaurants all located within 2 blocks of each other. Cleaning is included in the tariff if the stay is for 3 or more nights, stays under 3 nights a $75 cleaning fee will apply. Please note - internet is available at an additional cost - please enquire. Lovely veiws from the lounge and the balcony. Lovely veiws from the lounge and the balcony. Well equiped kitchen and beutiful furnishings. Very spacious for two people and close to the town centre. Will definately book again in future ?? Great apartment, well set up. Beautiful apartment with lots of light and plenty of windows to watch the sunset over the mountains. Fantastic property. Thanks very for having us. Lovely location for our stay in Wanaka, walking distance from town but the views from the deck made you want to hang out there and enjoy the sun most of the day!